When talking to clients who are implementing large implementations with Power BI, I have heard a lot of complaints. There is no good way to create a report which you just want to give to a client once. If you created the report with a workgroup, a pro feature, you cannot share with other users unless they also have a Pro License. The data size limits are too low for large users. The licensing model is really expensive for large users. Microsoft sought to resolve these problems with Power BI Premium, which allows companies to essentially buy their own Power BI Server. 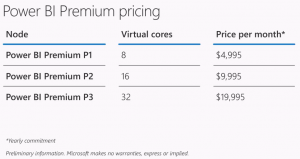 The pricing model for Power BI Premium is a lot different than Power BI has been in the past as they are moving away from the per user model and moving more towards a company license model, with three tiers. You will need to spend more money than listed in the three premium tiers. Pricing has become complicated and you might want to review the calculator site to figure it out. 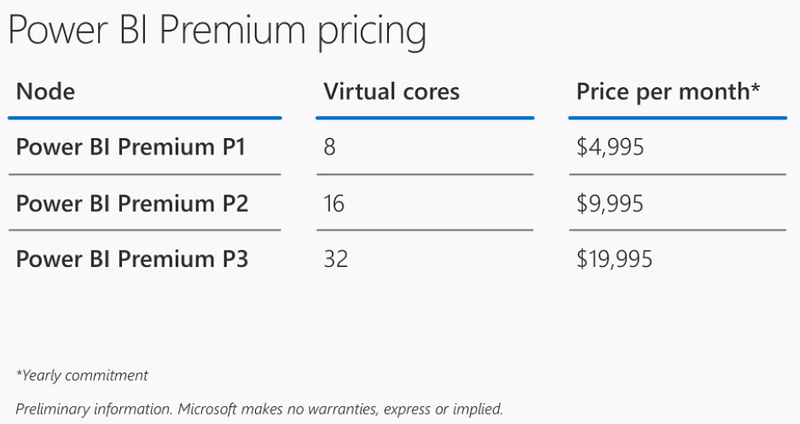 Premium Pricing covers the cost of the server, and unlimited read-only licenses. Everyone who creates reports will still need a Power BI Pro License. If you have an Office 365 E5 subscription, you will have a license already. If not, Power BI report creation requires a license. There is talk that Microsoft will develop additional tiers, for example something for education, development and for embedded only, but none of these have been Officially announced. Currently there are the three tiers only. If you currently run Power BI Embedded, in the future you will need a Power BI Premium License as this feature will not be available for Pro. Embedded is going to have one API, and that API is going to need to run on Power BI Premium. There has been a lot of discussion around this as there are a number of users who do not spend that much money on Power BI licenses, and they do not know what they are going to do going forward. While there have been distinct cutoff dates published for the free features of Power BI, I have not found any hard cutoff dates when Power BI Embedded applications must be migrated to Premium or they start working. I have read rumors about a license of less than $1,000 a month for Power BI Embedded, but this has not been published, so is only speculation at this point. More details will be coming out closer to the release date, which is targeted for sometime before July 1, 2017. I anticipate that Microsoft will be releasing more information at the Data Insights Summit on June 12-13 and I will be there to find out what the latest information will be and will post it here. I believe the current embedded customers have one year from June 1 or through the end of their Enterprise Agreement. Thanks for the clarification Meagan. I had missed the date that embedded support was going away.